A micro-biology scientific thriller that implodes into the worst excesses of mindless action, Outbreak is half of a good movie. A deep cast maintains interest, but the acting talent cannot overcome a script that sells out to cheap thrills. A deadly virus called Motaba breaks out in darkest Africa, causing death within hours. 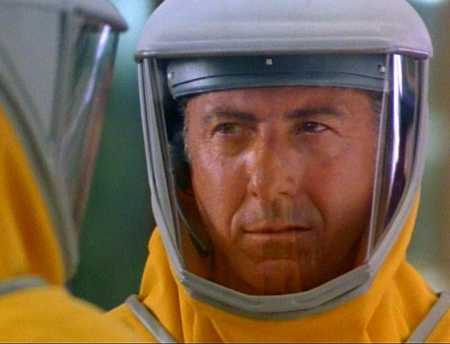 Infectious disease scientist Colonel Sam Daniels (Dustin Hoffman) of the US military and his team, including Major Schuler (Kevin Spacey) and Major Salt (Cuba Gooding, Jr.) are assigned to investigate. Motaba takes a ride inside a monkey with immunity to the virus, and crosses into the United States. Thanks to an unscrupulous pet smuggler (Patrick Dempsey), a lot of people are soon infected and start to die horrible deaths, with a concentration of cases in the town of Cedar Creek, California. Daniels is eager to help find an antidote, but his boss General Ford (Morgan Freeman), along with another military commander General McClintock (Donald Sutherland), are not so keen: they have known about Motaba since the late 1960s, and in fact the military has secretly converted it to a biological weapon, and has already developed a cure. Not willing to reveal these secrets, Ford and McClintock delay releasing the antidote, causing more misery in the now quarantined Cedar Creek. Daniels disobeys orders and teams up with his ex-wife Robby (Rene Russo) of the Centre for Disease Control to try to help the community, setting himself up on a collision course with his military commanders. 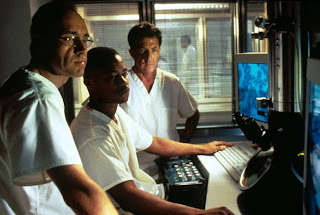 While the first half of Outbreak is a tightly wound examination of the battle between micro-organisms and man, with a cautionary look at how a lethal new disease can easily spread and devastate lives and communities, the back end of the story fragments into a ludicrous chase movie. Daniels and Salt set off on their own to attempt and save the town by finding the disease host, while McClintock spits venom and tracks them down to protect the military's dirty secrets. With stock helicopter chases and mid-air games of chicken replacing the smart science, Outbreak suffers from a most ignominious descent into banality. The cast deserve better. Although none of them stand out, all are uniformly good, and even the relatively minor roles are interesting in the hands of the likes of Spacey, Gooding Jr., and Dempsey. Rene Russo makes the forced sub-plot of a lost marriage between Daniels and Robby more palatable. Meanwhile, the old pros Hoffman, Freeman and Sutherland cut through the unfolding drama with practised ease. Hoffman's Colonel Daniels is the caring soul at the centre of the movie, a character suitable for Hoffman's persona although if anything, Daniels is almost annoyingly too pure in his dedication to the alleviation of human suffering. Freeman's General Ford is always going to be the hinge that will need to turn to change the course of the military's focus, and Freeman nails the veteran soldier disciplined to a fault but with a heart deep within his military uniform. Sutherland gets the easiest assignment: McClintock is mean as mean can be, and makes no apologies for his tunnel vision. Wolfgang Petersen directs with competence rather than passion, eager to give each star sufficient screen time and sacrificing any attempts at artistry in the process. Outbreak appeals to the brain early and the brainless brawn late, a jarring transition that splits the film in half and wounds its heart.